History of the "Attleboro Clock Company, Attleboro Mass"
The Attleboro Clock Company was identified on the clock dials as being located in Attleboro Massachusetts. However the one thing we know about the Attleboro Clock Co. was that it was never located in Attleboro, Massachusetts. Additional information about how we know that the Attleboro Clock Co. was not located in Attleboro, Mass. can be found in the Proof section of this web site. The “production source” of all clocks marked with “Attleboro Clock Co., Attleboro, Mass” was other clock manufacturers of the period. 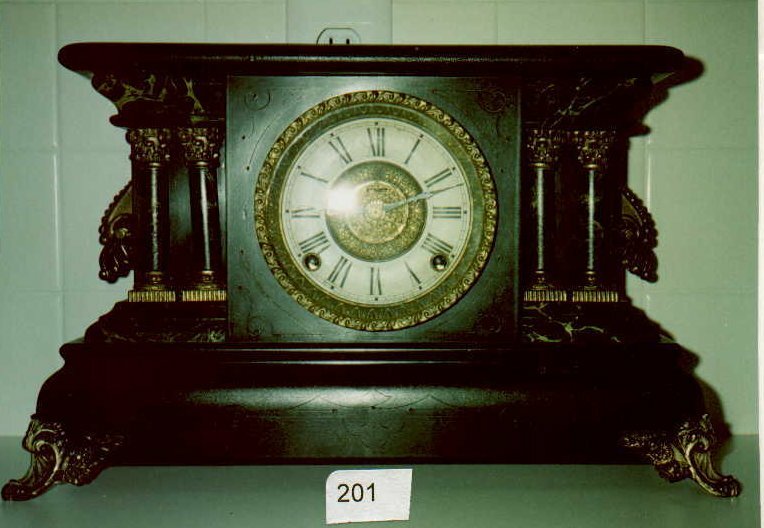 As of January 1, 2000, clocks produced by the Waterbury, Ansonia, E. Ingraham and Sessions have been found with “Attleboro Cloc k Co.” clocks. The two most common Attleboro Clock Co. clocks areThe “kitchen” style clocks (sample on the left) were produced by Waterbury, E. Ingraham and Ansonia, with the Waterbury oak case being the most common. The “black mantle” style clocks (sample on the right) were produced by E. Ingraham and Sessions. 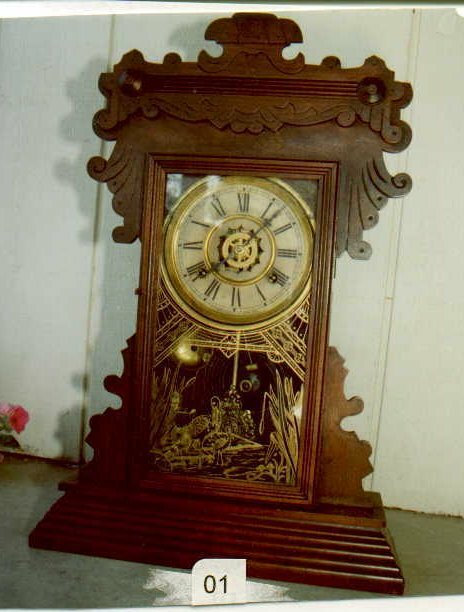 The Attleboro Clock Company was "in production" for a period of time between 1890 and 1915. This date range is an estimate determined by the style of clocks that have been found with "Attleboro Clock Co., Attleboro, Mass on the dial, several repair/purchase dates written on clock cases, and the patent dates stamped on some of the movements.. I think that he first clocks sold with the Attleboro Clock Co. name on the dial were walnut and oak kitchen style clocks made by the Waterbury Clock Company. These clocks are thought to be the earliest Attleboro clocks because the labels, when found intact, do not include a model name (note picture). The style of these Waterbury made walnut kitchen style clocks are similar to those Waterbury was selling in 1890 to 1905. The "Photos" page has samples of different Attleboro clocks sorted by manufacturer and case material. Later kitchen style Attleboro clocks manufactured by the Waterbury Clock company have been found with oak and walnut cases with Attleboro model names on the labels. All kitchen clocks manufactured by the Ansonia clock company have had oak cases and had model names on the labels when they were intact. Since there were so many different models of kitchen clocks produced during that period, it is difficult to use model design to determine an exact manufacturing date. To the best of my knowledge all Waterbury and Ansonia Attleboro kitchen clocks have pins holding the hands on. Using pins rather a than nut to hold the hands on could be an indication that the clocks were made earlier than other kitchen clocks nut, or it just could be an indication of an effort to minimize cost. The one E. Ingraham kitchen clock has a nut holding the hands on which indicates that it was produced at a later date. The Attleboro kitchen clock labels provide a very little information about manufacture date because of the lack of a publisher's mark. For Seth Thomas clocks on of the keys to date of manufacture is the publisher's mark on the label. The Attleboro clock labels have no information as to the label publisher. It is also interesting that the model name was always changed when the clock was modified for sale under the Attleboro Clock Co. name. For example an Ansonia "Belmont" model will have a label identifying it as an Attleboro "Royal" model. There are a few black mantle clocks with the Attleboro Clock Co. marking on the dial. These clocks were produced by E. Ingraham and Sessions. Black mantle clocks were produced starting about 1905 and Sessions began manufacturing clocks under the Sessions name in 1903.. I also have a picture of a Mahogany cased Attleboro Clock with an E. Ingraham movement that is almost identical to the E. Ingraham "Colby" model that I have dated to approximately 1915. On page 48 of Roy Ehrhardt's Clock Book 3, Identification and Price Guide there is a reference to a metal alarm clock made by the Attleboro Clock Co. Page 48 was identified at the top of the page with "Charles Broadway, Chicago – 1909." I obtained two Attleboro Clock Co. metal alarm clocks from an individual to specializes in metal alarm clocks. He told me that the older alarm clock was produced by Waterbury between 1895 and 1900 and that the newer clock was produced by Ansonia between 1905 and 1910. He also commented that efforts were made to produce these clocks as inexpensively as possible. For example the clocks were steel plated rather that nickel plated which was the standard at the time. I have an pocket watch which has Attleboro Clock Co. on the dial. The maker is unknown, but it has patents on it ranging from 1895 to 1899 indicating that the watch was produced about 1900. 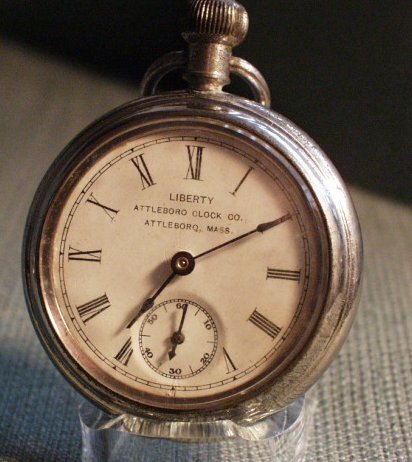 This pocket watch is an example of what is know as a "dollar" watch and is so inexpensively made that it is desirable to collectors because of its unique characteristics. On a standard pocket watch you set and wind the clock using the watch stem. On this Attleboro Clock Co. watch you have to open the back to wind or set the watch. To wind it you have to wind the tab that is directly on top of the spring, and to set it you use the stem that is in the center of the back of the movement. This is all the information I have about the Attleboro Clock Co. Hopefully, there is someone out there who knows more about the Attleboro Clock Co. and will pass the information on to me. My research efforts include the two visits to the National Association of Watch and Clock Collectors (NAWCC) library, extensive reading of microfiche of the 1881-1898 and 1907-1908 The Jewelers’ Circular and Horological Review magazine loaned to me by the NAWCC, and letters to Roy Ehrhardt and the Chicago Historical Society asking about the Charles Broadway company. Although my research has been somewhat limited, I am very new to this type of research and would sincerely appreciate suggestions as to where I might look.